As I arrived this morning at the Unitarian Universalist Church of Loudoun (Virginia), where you’ll usually find me on Sunday mornings, I took my seat, picked up a hymnal and glanced at the inside front cover. I do that out of habit, and this time I found what I was looking for. The bookplate identified the hymnal as the one that my wife, Carol, and I had donated to the church almost 15 years ago in memory of my Uncle Eddie. Eddie and his wife, Margaret, died together in 1983 – shot to death by their son Barry, my first cousin. Barry and I had been good friends growing up, but Barry as an adult suffered from paranoid schizophrenia. Now, with us both in our late 30s, he killed his parents. A decade later, he would hang himself in his jail cell. 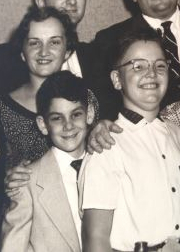 Photo from around 1955 shows me (with glasses), my cousin Barry, who would kill his parents, and my sister Marilyn, who died in a car crash. I’ve held that particular hymnal only a half dozen times or so in the last 10 years, and what made it remarkable today is that it’s the fifth anniversary of the auto accident that took the lives of my sister and brother-in-law, Marilyn and Alex Kaplan, another couple who died together. I noted that anniversary with a post this morning called A Sermon Walking. Sudden, traumatic death seems to be a pattern in my life. Less than four months ago, Carol and I got one of those dreadful early morning visits from two sheriff’s deputies telling us that our older son, Thomas, 29, had died when he fell from his skateboard on a steep hill. And this chain of traumas started almost 45 years ago, when my close friend and mentor Alice was stabbed to death in Trenton, New Jersey, just hours after she had left my New York City apartment after spending the weekend with me. Or maybe it started even earlier with the death of my father in 1958. That was a natural death after a long illness, but because I was only 11 with almost no emotional support, it had a traumatic impact. Getting back to that hymnal, donating religious books has a special significance for me. In his eulogy for Eddie and Margaret, their rabbi spoke of Eddie as a tireless volunteer, always standing over the rabbi’s shoulder with something in his hand that needed to be signed. “Here, Rabbi, sign this note to thank these people for donating prayer books” was how the rabbi remembered my uncle. Years later, when I told that story to my minister, the Rev. Dr. Gretchen Woods, at the Unitarian Universalist Church in Reston (Virginia), she said that could describe me as well. I swelled with pride. I have almost no academic credentials, but life has given me a doctorate in recovering from traumatic loss. I yearn to help others, with life in general as well as with loss. In my grief over the death of my son, I’ve turned to this blog as a vehicle to reach people – people who might find something they need in the words that I write. I’ve said of my sister, Marilyn, that when life handed her lemons, she didn’t make lemonade. She planted a citrus garden. I’m not sure I have it in me to aim that high. I’ll settle for taking a sad song and making it better.